Her first company, a digital media platform called Khula TV, provided networking resources and inspiring content for startup entrepreneurs preparing to launch and take their businesses to the next level. Mbali’s entrepreneurial pursuits have earned her features in a number of publications, including Essence Magazine, mindbodygreen, TheGrio, Applause Africa, The Frugal Feminista, Twenty Somethin’ and Black, and the Broad Roots Podcast. In addition to her entrepreneurial ventures, Mbali has worked with media companies and organizations dedicated to creating positive and diverse images of people of color. Since receiving her B.A. in African American Studies from Bates College, where her concentration in Visual Studies focused on examining the effects of media on Black youth, Mbali has held positions at BLACK GIRLS ROCK!, Word of Mouth Pictures, Turning Heads, and Firelight Media - organizations that have all won numerous awards for their pivotal work. Vivian Yang: Tell me a little more about yourself. Mbali Z. Ndlovu: My name is Mbali. I am born and raised in New York, originally from the Bronx. I am also half South African and half black American, two very interesting cultures to be a part of. I went to school in Maine at Bates college. I lived in South Africa for a couple years then moved to New York for about six years. The bulk of my post-college work life has been really focused on working with media organizations and companies that created content by and for people of color. I have always been passionate about creating positive and more diverse images by and for underprivileged communities. Yang: What inspired you to become a socially conscious entrepreneur? Ndlovu: I have had a lot of inspirations over the years. Ever since I was young, I knew I wanted to be an entrepreneur eventually. I thought it was going to be more focused around media, but something that has been very important to me has been economic empowerment, especially, as it pertains to underrepresented groups like African Americans. I feel like a lot of our vulnerability as a group, in this country in particular, unfortunately, exists because of a lack of resources and financial power. With entrepreneurship comes agency and social currency, at least in this country. So, I have always been passionate about entrepreneurship, but it took a while to figure out what exactly it would look like. So, I'm really happy that I finally figured it out. Yang: Did you face any challenges specifically as a a black female entrepreneur? If so, how did you overcome them? Ndlovu: You know… I’m sure people have made decisions subconsciously or behind the scene that I am just not aware of. So, I have a daily meditation practice now, and a big part of that involves me building up my confidence, courage, and really just trying to be less affected by other peoples’ opinions and actions. I am sure things have happened but I just try and not pay too much attention to things that either I didn’t see or happened behind the scene. But, I really try and surround myself with supportive people who believe in my vision and mission. I try to focus on small wins along the way. There’s a Vanity Fair Article that highlighted the 26 black women who have raised over a million dollar in VC funding. When you think about it, 26 is such a small number. It’s just a depressingly low number of role models that entrepreneurs like me can look up to. I would really drive myself crazy if I constantly thought about the hurdles, and the one thing that have been really powerful about entrepreneurship is that it really forces you to look at challenges as opportunities. Yang: What is the story behind Lukafit? What do you want consumers to take away from your brand? Ndlovu: A few years ago is when my health and wellness became a daily practice. That was because for the first time I had a group of accountability partners. So, a bunch of friends and I all decided that we were going to help each other out in this joint effort. So, we had a group calendar, a group WhatsApp, and we would invite each other to classes and check in on each other. That accountability was the first time I was consistent about working out and focusing on my health and wellness in general. That was a spark for me. It was so much easier to make my health a priority when you are in a community. So, that inspired me to start a meetup group for black women in New York, who like me, want to get healthy but want to do it with accountability partners. That group has now grown to almost 900 women and just talking to all those women over the years inspired me to start this bigger community. All those little inspirations led me to where I am now with my company, just realizing that health and wellness are so important. A lot of people, women of color in particular, are looking for a community to do it with. I want women, especially black women, to feel celebrated. A lot of women have spoken to me at my meet up saying that they feel ignored by bigger brands and excluded at fitness studios. I want them to feel celebrated, confident, comfortable, and included. Like, this is for you, we are here for you, and we see you. That’s what I want customers to take away. Yang: What role has fitness, healthy living, and staying active played in your personal life? Did you play any sports? Ndlovu: I have always felt like a pretty health conscious person. My family was vegan for a little bit when I was younger. We always ate pretty healthily in my home. I never was really a big sports person. I have always loved running. I tried doing track for a little bit but it never stuck. But I really loved dance. I was on dance troop. I have always loved movement and staying active but never really had a workout regiment until, honestly, a few years ago. Yang: What was the inspiration behind the limited edition self-care sister legging? Ndlovu: Honestly, all the inspiring women that I have met on my own health and wellness journey. As I started doing more research, a lot of the report really paint a void picture of black women health. I don’t think the reports show the entire picture, because I was meeting all these women in my meetup group and finding all these fitness communities online, some of which has thousands and hundreds of black women in them. I was seeing something totally different, at least a more nuanced version of what I was reading in the health report. I really just want to celebrate and honor all these women who were getting more active, finding each other and creating their own solution. Yang: What are your views on the body positivity movement in sports and wellness for all bodies? Do you think the body positive movement has affected the black community in any ways specifically? Ndlovu: I am glad it is finally happening, but I think it is a little late. You know… Especially in the U.S, we come in all different shape and sizes and it has been that way for years. So, it is sad that it has taken so long for this movement to pick up, but I am happy that it is finally permeating the society. Better late than never. I think it is very necessary because it is very important for a person who says they want to lose 30 pounds to feel happy with themselves on a day to day basis. It is not healthy for me to hate the body that I am in, because I am in it now. You are not going to change overnight. I think it is important for all of us to learn to accept ourselves as we are, even if we are trying to be a healthier version of who we are. That acceptance, today, is very important, physiologically. I think these movements are coming up at the same time. There is obviously some cross-pollination. I think as the general population starts to accept and celebrate bodies that are above a size four, it is going to generally include a lot of women of color who have different bodies. I don’t think it is an automatic overlap, but I think eventually there is some cross-pollination happening. I think it has to purposeful. I don’t think it is a trickle down thing. I think it has to be intentional which is part of the reason why Lukafit exits. Yang: How do you think feminism has affected the body positive movement? What more do you think can be done to make the movement more inclusive? 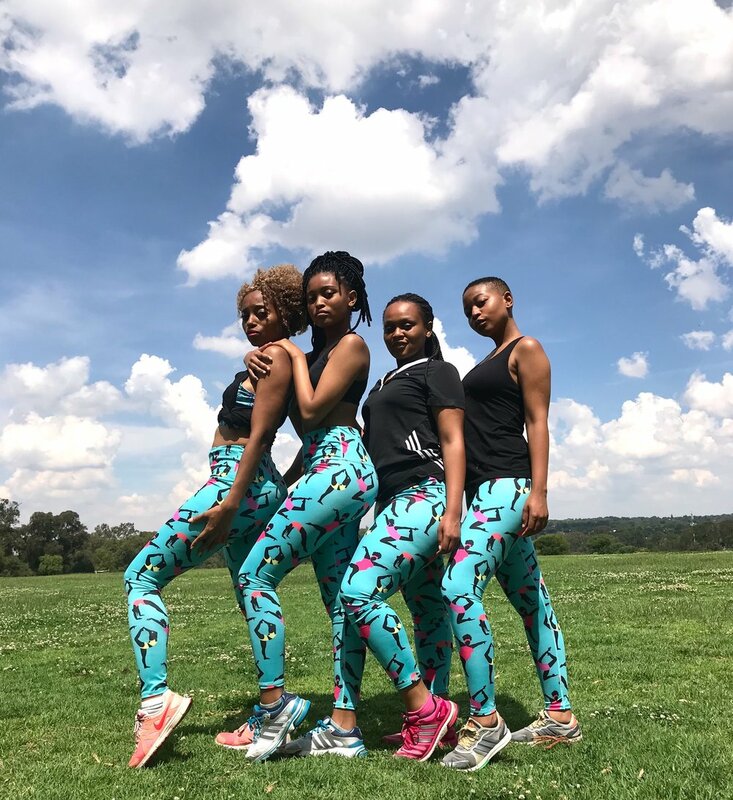 Ndlovu: I don’t know if you can attribute it to feminism specifically… I think the body positivity movement has come out of people who didn’t see themselves reflected and who are just trying to create solutions. So, I don’t know if that is a feminist thing. I think it was probably curvier women who just started coming together and demanding change. That’s tough. Obviously, it would be better for companies to take it upon themselves to realize that we are not including everyone in our marketing and sizing. But we all know that is not how it usually happens. Usually, it takes a community coming together and demanding change. But in a perfect world, the execs of these companies would wake up and take it upon themselves to act before it was demanded of them. The brand would have to be preemptive instead of reactive. You know… That is why there is so much opportunity for my brand. Because a lot of people are feeling so excluded, that is the reason that I can release a legging and have the reception be so overwhelming. People just aren't used to it. People would literally point to the woman on the legging and be like "I see myself for the first time". I have to take advantages of those opportunities that have been created by these gaps. It is what it is… People like me are just stepping up. Yang: What do you see for Lukafit as a company in the future? Ndlovu: I am working on the next designs now. I will be organizing some exciting release events around that. So hopefully that will be happening late summer. I really see Lukafit as the future for health and wellness for black women and eventually maybe women of color in general. I want to help spark a health and wellness movement that motivates women of color across the world to become happier, healthier, and more confident versions of themselves. That is my ultimate goal.